Launch an assault on the Endless Stair and destroy the Planar Vortex. The Endless Stair — End the threat of the Planemeld once and for all. The final assault to end the Planemeld is at hand. We need to fight our way through Molag Bal's defenses and reach the portal to the planar vortex. Only then can we end this threat and save our world. Talk to Gabrielle Benele and Hahnin. Choose either Cadwell, Darien Gautier, Skordo the Knife or Tzik'nith to accompany you. Talk to Vanus Galerion then enter the Labyrinth. Make your way through the Labyrinth. Find the Planar Vortex Portal, talk to the Groundskeeper, then enter the portal. Destroy the remaining Dark Anchors. Confront the Council of Molag Bal. Defeat Molag Bal's minions, then activate the Light. Talk to Meridia and then King Dynar. Talk to Vanus Galerion near the Endless Stair wayshrine. You need to open the Labyrinth before the entire army enters. You need to speak to Hahnin and Gabrielle to learn about the Guilds' strike teams following you. Gabrielle Benele is to the west. She says you will need to close Molag Bal's reinforcement portal before you open the Labyrinth. Hahnin, who is to the east, allows you to choose a companion if you want. However, you cannot choose Hahnin. Depending on your progression and decisions in Coldharbour, you can choose between Cadwell, Darien Gautier, Skordo the Knife or Tzik'nith. Talk to King Laloriaran Dynar once you have chosen your companion. He will give a speech, mentioning your companion and your tasks. Angof gives you a seed which you can use on the bodies of dead Dremora to turn them into a helpful zombie. Estre gives you the Mask of Shadows which lets you summon the Shadow Court Jester to fight enemies. Thallik will let you use his death rune again. Once you get to the reinforcement portal area, you need to kill the Guardian of the Gate to be able to close the portal. If you have sided with the vampires at the Harvest Heart, a group of them will come to your aid. As you approach the Labyrinth, Vanus Galerion will appear. Gabrielle and her mages will accompany you in the Labyrinth. Talk to her inside the Labyrinth. You need to find some way to open the library gate. Talk to Malkur Valos. He says the tubes on the walls are daedric devices that need power to operate. You need to figure out how to move the blue flames over to the openings of the tubes. Talk to Raynor Vanos. He says touching the braziers will allow you to move the flame. Touch the brazier, then use the daedric flame. The Cold Fire Brazier option will appear when you look at the openings on the walls. Once all four pipes are lit, you will be able to enter the next area. Cross the bridge, and enter the dark chamber, an area so dark you can barely see. If you have completed The Soul-Meld Mage, Gadris or Zur will be there to provide illumination. Otherwise, you may follow the braziers as they light up. Using Magelight or Almalexia's Enchanted Lantern will also work. Cross the bridge, then enter the statue room. Stay close to Gabrielle, and cross to the other side of the statue room. She feels like something bad will happen, and the stone statues start to attack both of you. Gabrielle leads you to the southwest. There is a door to the Endless Stair, but it is shut with magic. Gabrielle will open the door, but you need to protect her. Unfortunately, the door shuts behind you and Gabrielle. The others are trapped for now. Vanus Galerion sends you to the Planar Vortex Portal. Defeat the enemies in your way, then talk to the Gatekeeper who appears before the portal. She says you need to enter the Planar Vortex, destroy the Dark Anchors and unleash the power of the Light of Meridia at the focal point of the Planemeld. You enter the Planar Vortex portal and see a Dark Anchor. The Groundskeeper turns into Meridia and destroys it. 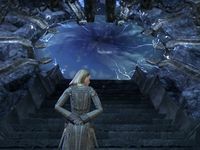 Darien, Gabrielle, King Dynar, Cadwell, Kireth and Raynor Vanos, and Faraniel or Tzik'nith will enter through the portal. You destroy Molag Bal's Council (Clorsatari, Kehothar and Verkynvayl) one by one as they discuss what to do about the Light of Meridia. 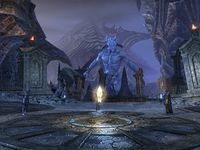 Molag Bal appears behind them, but Meridia and your allies also appear. 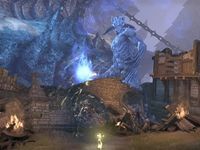 Meridia shields your group, and you, Darien, and King Dynar fight off Molag Bal's minions while Vanus and Gabrielle work on activating the Light of Meridia. Once their spell is complete, you must get into Meridia's shield, and will be teleported out of the Vortex. You awaken back in the Hollow City, Meridia's pocket realm of Oblivion. 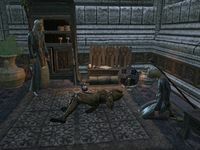 Your friends who helped fight the final battle are alive, but the Ayleid King Laloriaran Dynar was gravely wounded and Darien has gone missing, as they were not fully within Meridia's shield. Vanus and Gabrielle will be found alongside King Dynar. With his dying breath, the King gives you Ayleid's Wrath, a two-handed sword, as a gift from his people. I need to speak to Hahnin and Gabrielle to receive their briefings on the Fighters Guild and Mages Guild battle plans. I need to decide which soldier to take with me to close the reinforcement portal and open the way into the Labyrinth for the rest of our forces. I selected a companion to accompany me on my initial foray into Molag Bal's inner domain. I should tell King Dynar that I'm ready to go. King Dynar is briefing me on the final orders for my mission. I should listen to what he has to say. I need to fight my way to the portal where Molag Bal can call in reinforcements. The Guardian of the Gate stands in the way of my efforts to close the reinforcement portal. I need to defeat her to finish the first phase of my mission. I need to close the portal to prevent Molag Bal from sending more troops in to stop us. Now that the reinforcement portal has been closed, I need to go to the Labyrinth and open the way into Molag Bal's inner sanctum. I unlocked the way into the Labyrinth and then Vanus Galerion opened a portal behind me. I should speak to him before I enter the door. I should enter the Labyrinth and locate the portal to the planar vortex. I should speak to Gabrielle and see if she has any advice on how I should proceed through the Labyrinth. I need to figure out how to operate the devices that open the door on the other side of this room. I used the device and opened the door to the next area of the Labyrinth. I should proceed through the door and continue my search for the planar vortex. A dark chamber stands before me. I need to find a way to get across it if I want to advance through the Labyrinth. I should follow Gabrielle across the bridge. I need to continue deeper into the Labyrinth if I'm going to locate the planar vortex. The door locked behind us as soon as Gabrielle and I entered this chamber. We need to find a way to proceed deeper into the Labyrinth. Gabrielle opened the exit. I need to follow her into the next area. Only Gabrielle and I made it into the next area before the door sealed behind us. But then a portal opened and Vanus Galerion appeared. I should talk to him. Vanus tells me the portal to the planar vortex is close by. I need to find it so we can stop the Planemeld. Molag Bal has thrown yet another guardian in my path. I need to defeat this creature to reach the portal to the planar vortex. As soon as I defeated the portal guardian, the mysterious Groundskeeper from the Hollow City appeared. I should talk to her. In order to stop the Planemeld and save Nirn, I need to enter the portal that leads to the planar vortex. I've entered the planar vortex, the one remaining link in Molag Bal's insidious Planemeld. I need to destroy the Dark Anchors before we can disrupt the vortex. Well, that makes a certain amount of sense. The Groundskeeper is Meridia! She wants to talk to me before we proceed. My allies have entered the planar vortex. Meridia has given me time to speak to them before I let her know I'm ready to continue. As long as the Dark Anchors bind the two realms together, we won't be able to disrupt the planar vortex. I need to destroy the remaining Anchors. The Dark Anchors have been destroyed and the vortex has become unstable. I need to find the focal point and place the Light of Meridia. Molag Bal's most powerful minions stand before me. I need to defeat them before I can unleash the cleansing power of the Light of Meridia. The Light of Meridia is ready to be unleashed on the Planar Vortex. I must activate it before it's too late! It appears that we succeeded. The Planemeld has been defeated, and it looks like I'm still alive. I should speak to Meridia and ask her what happened. Finishes quest Even though we stopped the Planemeld, it looks like King Dynar was mortally wounded. I should speak to him while there's still time.